Anritsu Company has introduced ISDB-T and DVB-T/H bit error rate (BER) measurement options for its MS2712E/MS2713E Spectrum Master™ handheld spectrum analyzers and MT8212E/MT8213E Cell Master™ base station analyzers. With the options, the four models provide broadcasters, network operators, network installers, sub-contractors and regulatory authorities with a complete portfolio of digital broadcast measurements to properly install and maintain transmitters, repeaters and gap-fillers, as well as to determine signal coverage. The options expand the measurement capabilities of the MS2712E/MS2713E and MT8212E/MT8213E, and provide users with the broadest portfolio of digital broadcast measurements for ISDB-T and DVB-T/H available in handheld instruments. The BER measurements, together with the other digital video and SFN measurement options, help ensure digital TV transmitters are configured according to license agreements and optimized for error-free reception over the entire coverage area. For the ISDB-T BER function, Anritsu has utilized Silicon Infusion's Zaltys™ 3-Layer ISDB-T Demodulator core technology. The core integrates a high-performance COFDM demodulation engine and a fully compliant deframer, which helps the MS2712E/MS2713E and MT8212E/MT8213E provide high-quality real-time measurements. 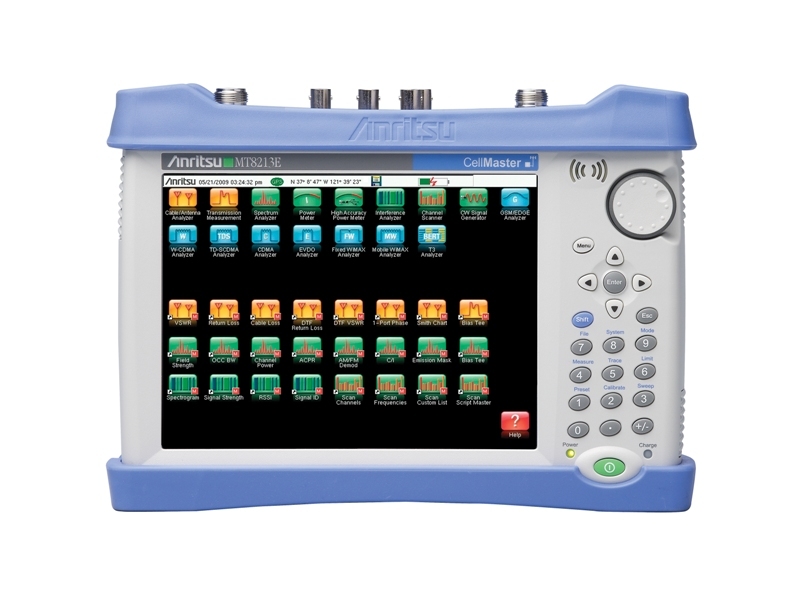 Anritsu has made other enhancements for DVB-T/H testing applications. The frequency tuning ranges on the MS2712E/MS2713E Spectrum Master and MT8212E/MT8213E Cell Master models have been extended to 2.4 GHz. A frequency map for automatic channel selection from VHF channels 5-12 has also been added, for European testing environments. In addition, the MS2712E/MS2713E provide excellent flexibility for locating, identifying, recording, and solving communication system problems without sacrificing measurement accuracy. Each analyzer has dedicated routines for simple one-button measurements of field strength, channel power, occupied bandwidth, adjacent channel power ratio (ACPR), carrier-to-interference ratio (C/I), and AM/FM/SSB demodulator. With advanced marker and limit line capabilities, the flexibility and power is available to meet all types of field measurement needs. The MT8212E/MT8213E handheld multi-function base station analyzers are the smallest, lightest, and most economical solutions for installing, troubleshooting, and maintaining transmitters and cell sites. The Cell Master family combines the functionality and capabilities of a cable and antenna analyzer, spectrum analyzer, interference analyzer, signal analyzers, backhaul analyzer, and a power meter into one instrument, making it the most full-featured compact base station analyzer on the market. The ISDB-T and DVB-T/H options are available now.